Protection from risk isn't the only reason. With the S&P 500 (SNPINDEX:^GSPC) having hit new all-time record highs on Friday, it's a good time to take a look back and see where the index's most recent gains have come from. Somewhat surprisingly, value stocks appear to be taking the lead in pushing the overall market higher, while growth stocks have lagged behind somewhat. Let's take a closer look at the trend and see if we can come up with a good explanation. Standard & Poor's is kind enough to calculate its own growth and value indexes. It takes the companies in the S&P 500 and looks at growth factors like revenue and earnings growth as well as share-price momentum, as well as value factors including ratios of stock price to book value, earnings, and revenue. After ranking the stocks, S&P divides them into three categories, with a third of stocks going solely into the value basket and another third going into the growth basket. The middle third combines elements of both and are thus included in both indexes, but with weightings that reflect their respective growth and value attributes. As you can see from looking at the iShares ETFs that cover the two sets of stocks in the S&P 500, over the past year, value has beaten out growth. 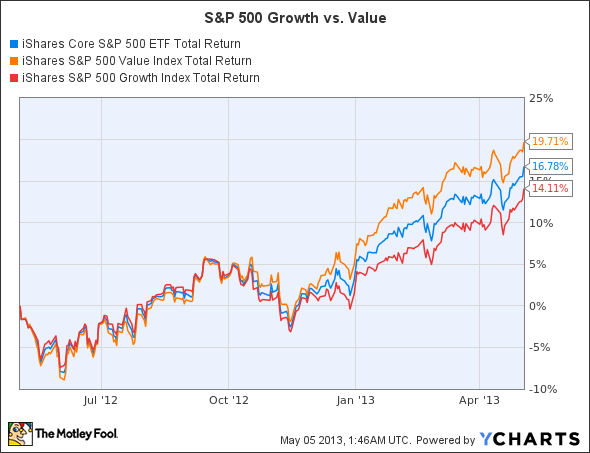 With a better than five-percentage-point advantage, value has clearly done exceedingly well. What's behind that outperformance? As it happens, probably the biggest contributor to growth's troubles is Apple (NASDAQ:AAPL). With declines of 15% so far this year despite its big rebound more recently, Apple has a huge weighting of about 5.7% as a pure growth stock. In fact, it's the only stock in growth ETF's top 25 holdings that has posted declines for 2013. Surprisingly, defensive stocks aren't really contributing to value's dominance, in part because many of those stocks no longer qualify as pure value stocks according to S&P's methodology. Johnson & Johnson (NYSE:JNJ) and Procter & Gamble (NYSE:PG) appear in both indexes, with J&J actually having a greater weight in the growth ETF than in the value ETF. The reason: investors have bid those companies' stocks up so far that their P/E ratios and other valuation measures no longer resemble value stocks. Rather, financial stocks have taken over the lead as top vale prospects, with AIG (NYSE:AIG) and major Wall Street banks having become pure value plays once again. Value and growth stocks tend to move in and out of favor over time, so there's no one right answer as to which strategy is best. Rather, choosing value or growth is more of a personal investing preference, and ideally, keeping both as viable options can be your best chance to maximize your most promising investment opportunities.